I’ve been playing with MQTT in previous posts. Today I want to build a simple dashboard. Basically because I’ve got a 3.5inch display for my Raspberry Py and I want to use it. The idea is set up my Rasperry Pi as a web kiosk and display the MQTT variables in real time using websockets. Let’s start. Set up Raspberry Pi as a web kiosk is pretty straightforward. You only need to follow instructions detailed here. Now we will prepare the MQTT inputs. Today we’re going to reuse one example of previous post. A potentiometer controlled by a nodemcu microcontroller connected to our MQTT server via Wifi. We also will build another circuit using a Arduino board and a ethernet Shield. Yes. Finally I’ve got an arduino board. It’s time to hack a little bit. Today I want to try different things. I want to display in a webpage one value from my arduino board. For example one analog data using a potentiometer. Let’s start. We are going to use one potentiometer. A potentiometer is a resistor with a rotating contact that forms an adjustable voltage divider. It has three pins. 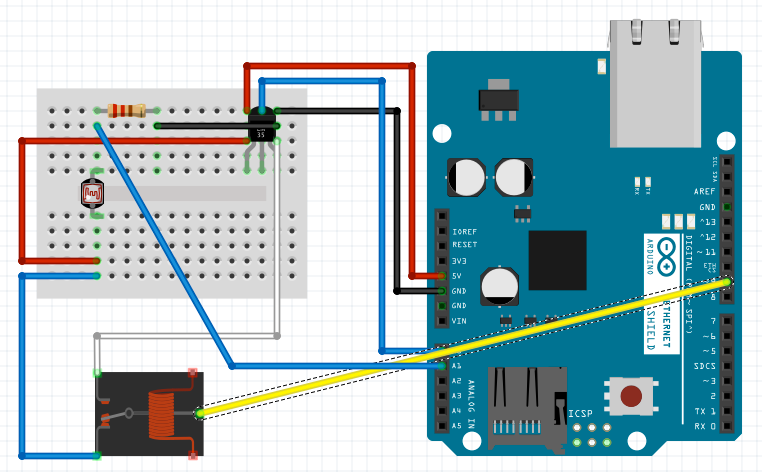 If we connect one pin to 5V power source of our arduino, another one to the ground and another to one A0 (analog input 0), we can read different values depending on the position of potentiometer’s rotating contact. We can test our program using the serial monitor of our arduino IDE our using another serial monitor. Basically we’ve got our backend running. Now we can create a simple frontend. We’ll need websockets. I normally use socket.io but today I’ll use Crossbar.io. Since I hear about it in a Ronny’s talk at deSymfony conference I wanted to use it. We’ll use Docker. I’ve got a Docker host running in a Raspberry Pi3. The Raspberry Pi is a ARM device so we need docker images for this architecture. The Esp32 part is very simple. We only need to connect our potentiometer to the Esp32. The potentiometer has three pins: Gnd, Signal and Vcc. For signal we’ll use the pin 32. We only need to configure our Wifi network, connect to our MQTT server and emit the potentiometer value within each loop. 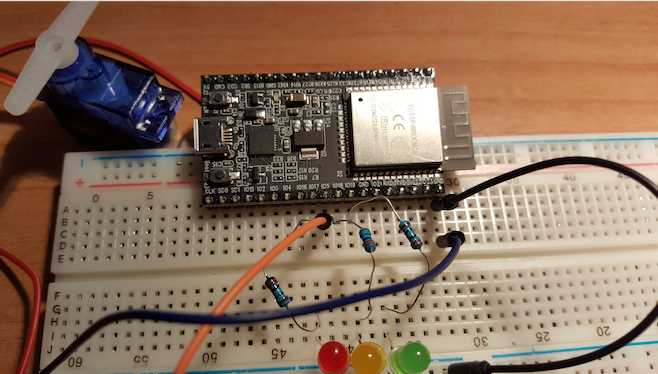 The esp32 emits an event (“/pot”) with the value of the potentiometer. So we’re going to create a MQTT listener that listen to MQTT and persits the value to InfluxDB. In grafana we need to do two things. First to create one datasource from our InfluxDB server. It’s pretty straightforward to it. Finally we’ll create a dashboard. We only have one time-serie with the value of the potentiometer. I must admit that my dasboard has a lot things that I’ve created only for fun. 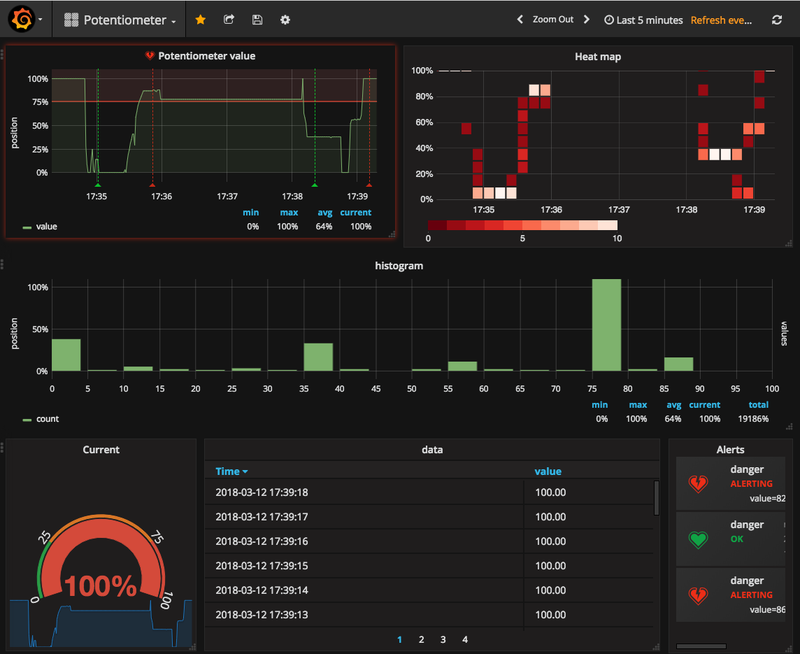 Grafana will emit a webhook, so we’ll need an REST endpoint to collect the webhook calls. I normally use PHP/Lumen to create REST servers but in this project I’ll use Python and Flask. Imagine that we’ve got our system up and running and the state is “ok”. Now we connect one device (for example one big red/green lights). Since the “ok” event was fired before we connect the lights, our green light will not be switch on. We need to wait util “alert” event if we want to see any light. That’s not cool. MQTT allows us to “retain” messages. That means that we can emit messages with “retain” flag to one topic and when we connect one device later to this topic, it will receive the message. Here it’s exactly what we need. Finally the Nodemcu. This part is similar than the esp32 one. Our leds are in pins 4 and 5. We also need to configure the Wifi and connect to to MQTT server. Nodemcu and esp32 are similar devices but not the same. For example we need to use different libraries to connect to the wifi. 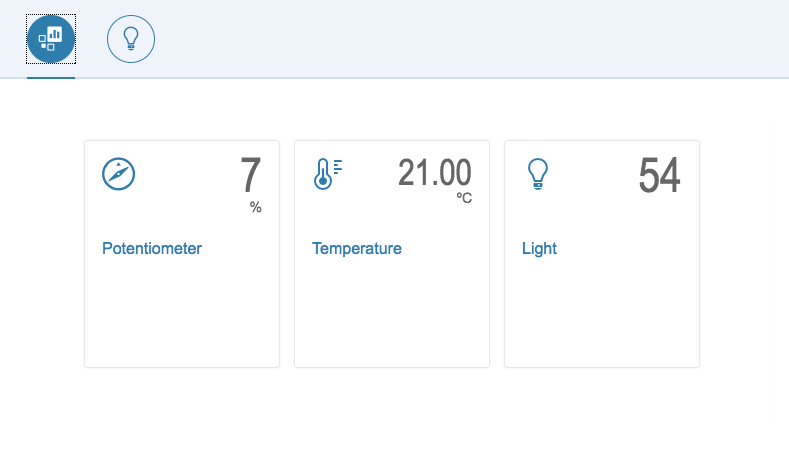 These days I’m playing with IoT. Today I want to use MQTT protocol to comunicate between different devices. First I’ve start a mqtt broker in my Laptop. For testing I’ll use mosquitto server. In production we can use RabbitMQ or even a 3party server such as iot.eclipse.org or even Amazon’s IoT service. The idea is emit one value with one device, and listen this value whit the rest of devices and perform one action depending on that value. 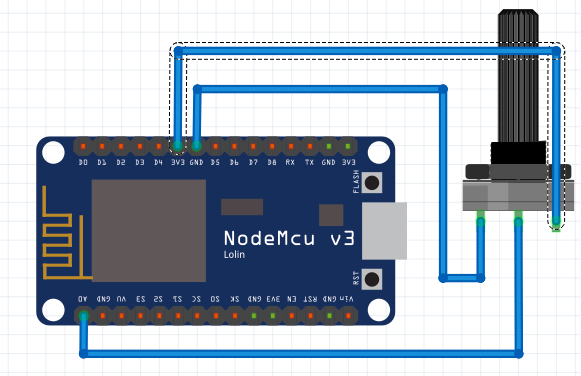 For example I will use one potentiometer connected to on NodeMcu micro controller. Now we will use another Arduino (with a ethernet shield). We’ll move one servomotor depending to NodeMcu’s potentiomenter value. 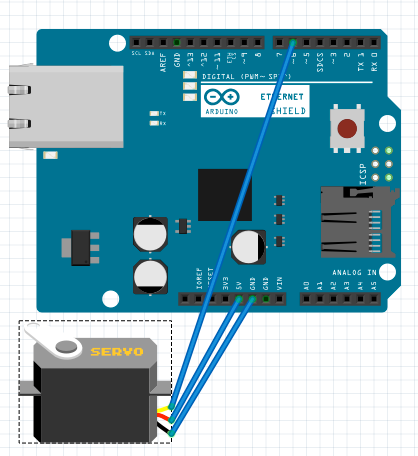 This Arduino only needs to listen to MQTT’s topic and move the servo. Source code is available in my github. I’ve written a previous post about Sharing authentication between socket.io and a PHP frontend but after publish the post a colleague (hi @mariotux) told me that I can use JSON Web Tokens (jwt) to do this. I had never used jwt before so I decided to study a little bit. We’re going to create the same example than the previous post. Today, with jwt, we don’t need to pass the PHP session and perform a http request to validate it. We’ll only pass the token. Our nodejs server will validate by its own. // try to re-connect using this token and it's expired. Full project in my github.